Today, the Senate voted 56 to 43 against proceeding to the Defense Authorization Act (S. 3454). This procedural vote, which basically followed party lines, ends consideration of some critical social issues—offered as amendments—that affect the military. Among the amendments not considered were a repeal of “Don’t Ask, Don’t Tell” and the DREAM Act, an immigration bill that would provide legal status to young people who graduate from high school and pursue college or military service. While Democrats blame Republicans for prioritizing procedure over policy and Republicans blame Democrats for trying to shore up the Latino vote before midterms, it’s the roughly 800,000 undocumented students who should blame Congress for its inability to legislate. But where does that leave the approximately 114,000 potential DREAM beneficiaries with at least an associate’s degree who would be immediately eligible for conditional legal permanent resident (LPR) status? Where does that leave the other 612,000 potential beneficiaries who would be immediately eligible for conditional status because they already have a high school diploma or GED? And where does that leave the 934,000 other children under 18 who would be eligible for conditional LPR status in the future? Following the Senate’s vote against the motion to proceed with the Defense Authorization bill, Senator Durbin, co-sponsor of the DREAM Act, gave an impassioned speech promising the DREAM Act students that he will continue to fight for them. I would say to my friends and colleagues on both sides of the aisle, where is the justice in this decision? At least have the courage to let us bring this matter to the floor and stand up and vote no… It is inconsistent with the spirit and the history of this chamber where we deliberate, debate and vote. I will tell those following this debate … my promise to them is this: as long as I can stand behind this desk and grab this microphone and use my powers as a United States Senator, I will be pushing for this DREAM Act. It is my highest priority. It is a matter of simple American justice…. For those who are so sad today, take heart. Tomorrow is another day…and we’ll be there to fight for you. And many others will join us. Don’t give up your dream to be part of this great nation. I want everyone within the sound of my voice to understand how much I appreciate, and thousands and thousands of others, Senator Durbin’s advocacy on this issue. But I also want everyone within the sound of my own voice to know that we’re going to vote on the DREAM Act, it’s only a question of when. That’s all this is about, basic fairness. But this isn’t the end of this. We’re going to continue to move on. 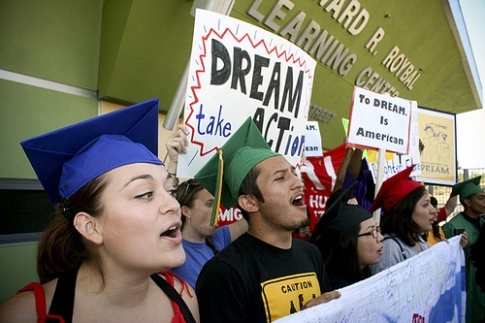 Maybe Congressional promises to keep fighting for the DREAM Act are enough; maybe they aren’t. But what the DREAMers can take heart in is the energy and enthusiasm they reverberated through the Senate this week. Because of their efforts, more people today understand the importance of DREAM to our economy, our military, and the future of our country than ever before. Their energy, creativity, and commitment illustrates precisely why they will eventually prevail—they are willing to fight for their American DREAM.